Capitol Hill sledding: Kids sled down Capitol Hill despite anonymous lawmaker's complaints. An anarchist punk terrorizes our nation’s capital. 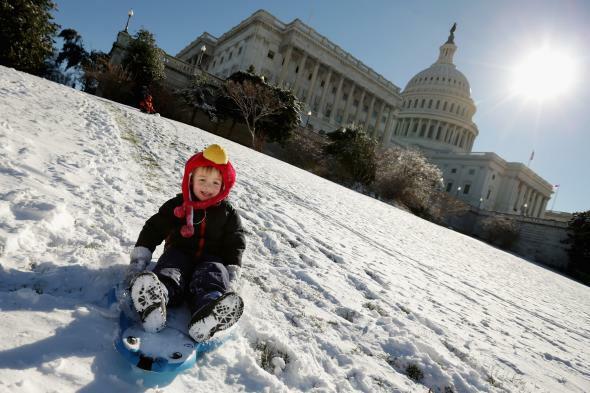 Before the snow started falling in Washington, D.C., Thursday morning, Capitol Police said that sled-toting children would be escorted off the hill outside the home of Congress if they tried to defy a sledding ban that was put in place after 9/11 but not enforced consistently until this winter. The rebellious youth would not be denied, though, and with a snow day declared and a healthy layer of fresh white powder on the ground, a mitten-clad mob of them marched on the seat of power with their parents and their brightly colored plastic shields and slid all over the authority of the federal government. The afternoon sled-in, promoted by D.C. blog Popville, was observed by several local media outlets. The cameras might have made the Capitol Police a little reluctant to haul the little lawbreakers off to the clink, and plastic met snow without anyone being arrested. Officers are reportedly sympathetic to the sledders, and inside the Capitol, no one wants to admit to being the “congressional grump” alleged to have insisted on this year’s crackdown. One officer dispatched to enforce the rule a couple of weeks ago cited a complaint from “the head of the appropriations committee,” according to one of the illicit sledders, but the relevant members of both chambers were quick to deny involvement when contacted by Roll Call.